Lead guitarist of the Dark Troubadours, Dayan was renowned for his mesmerizing performances. His melodies stilled crowds, beckoned, seduced. And always, he called to her to complete him. Corinne Wentworth stood at the vortex of a gathering storm. Pursued by the fanatics who'd murdered her husband, she was risking her life by keeping more than one secret. Fragile, delicate, vulnerable, she had an indomitable faith that made her fiery surrender to Dayan all the more powerful. Awesome, the tension rips you apart and bares your soul to feel the true pain and fear that the characters feel. It brings you into the book, the world of the characters and wraps you so tightly into their experiences that you can not help but feel what they feel. Amazingly well written. If you are a fan of Paranormal Romance, this book has it all. Between the pages you find suspense, mystery and love so deep that you cry. Corrine, our heroin, is a little different than Feehan's other converts. 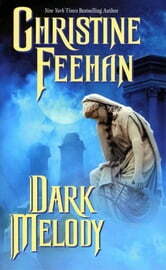 If you are a Christine Feehan fan,you will enjoy this book on so many different levels, but if I was to tell you? Just read the book and find out for yourself. Love the carpathians. I can't wait for more. Christine Feehan is one of my favorite authors. Thank you.